In this lesson, we learn how to make a delicious mirror glaze and once again accuracy is key. Helen uses quite an expensive hand blender which is fantastic, but any electric blender you have available in the kitchen should do the trick. Helen tends to use plastic containers when working with chocolate as they don’t retain the heat quite the same that the glass ones do. Thus allowing you more control over your temperatures. Helen now pours the glaze over the mousse as well as a pre-ganached cake. 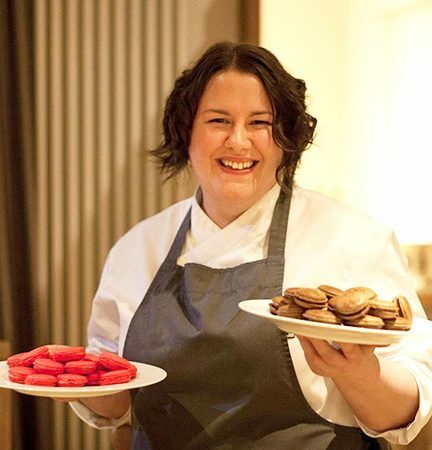 Helen Vass is an award winning pastry chef based in Glasgow, Scotland and runs her own patisserie & consultancy business, Dulce by Helen Vass. Helen was the winner of the Callebaut Patissereie Chef of the Year 2017 award at the CIS (Catering in Scotland) Excellence awards and was a finalist in the same category in 2016. Furthermore, she also won the Dessert Gold Medal for her work at the Scottish Food Awards & Academy in May 2017. She was the former head pastry chef of 2AA rosette restaurant, Number 16, on Glasgow's Byres Road for nearly 2 years. In May 2016, Helen was part of the winning team of BBC2's Bake Off Creme de la Creme along with team captain, Mark Tilling and team mate, Samantha Rain. Helen previously worked in Pastelería Escribà in Barcelona. This role took her out to Singapore to work at Marina Bay Sands on the worlds first theatrical event, Fantasía by Escribà. She also worked at the 5* hotel, Blythswood Square, in Glasgow. Every day is a school day in the kitchen and Helen is always seeking to learn new skills and has done stages in the kitchens of World Champion Pastry Chef, Jordi Bordas and Barcelona baker, Daniel Jorda. Furthermore, Helen has done pastry courses with the following chefs in both the UK and overseas.